With a small amount of money, a desire to excel, and 18 years of jewelry experience, Mickey Hearne first opened the doors to Hearne’s Jewelers on June 3rd of 1972 in New Bern, NC. In July, his wife Laura, then of 15 years, joined her husband in the business and remains there to this day. Mickey and Laura were quite a team. They watched their business flourish before their eyes. They always treated their customers with respect and courtesy, and gave many folks their first line of credit. 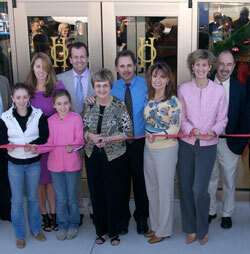 Hearne’s Jewelers became known as the store that combined courtesy with integrity. Hearne’s occupied 256 Middle Street for 22 years until it closed its doors in November of 1994. A second location, which was opened in October of 1989 at Rivertown Square, continued to flourish under the guidance of Mickey’s sons, Jimmy and Mike. Hearne’s continued to be a business that many people knew and trusted. Upon Mickey’s retirement, Laura joined her sons at Rivertown Square and continued to serve a long line of customers they count as friends. In November of 2008, with Mom at their side, the Hearne boys realized a dream of their own in the opening of Hearne’s Fine Jewelry residing at 1331 McCarthy Blvd. The convenient location and exquisite showroom make a visit to Hearne’s a memorable experience. In January of 2018, Jimmy Hearne retired from the business with many long hours invested into making Hearne's what it is today. While the Hearne family has seen many changes throughout the years, Hearne’s Fine Jewelry is still practicing the belief on which it was founded… a store that combines courtesy with integrity. Hearne’s employs a certified appraiser and 3 on site jewelers who specialize in custom design, loose diamonds, platinum and gold creations, precious and semi-precious stones, and elegant time-pieces. Hearne's numerous elegant designer lines, vintage estate and consignment pieces, and all in-house jewelry repairs are just a few of Hearne's hallmarks. Come see for yourself what everyone has been talking about for the last 45 years. Hearne's Fine Jewelry...creating memories for life!